As a symbol of wealth and harmony, the goldfish is a popular choice of tattoo. 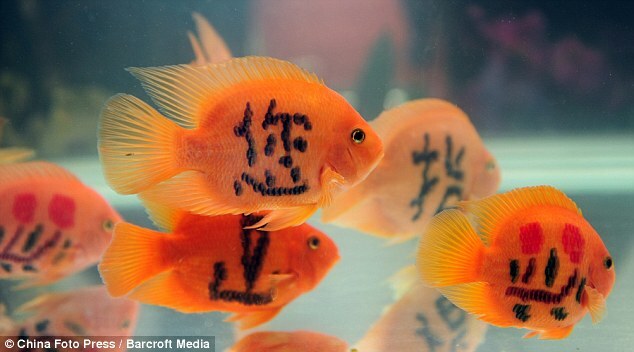 But in a craze sweeping China, goldfish are themselves being inked with patterns and characters intended to being their owners good fortune. These ones were being displayed during a tropical products trade fair in Haikou in the Hainan Province of China on Wednesday. The tattoos are said to be the result of an injection with special medicine which takes half a year to form. Other methods use lasers. Tattooed fish first appeared on the market in 2005 and have become very popular in the last year or two. The technique is not without its critics, however, who claim it is not only cruel, but against the laws of nature. Earlier this year, the public reacted angrily when a magic trick with goldfish watched by hundreds of millions of Chinese on TV during the Lunar New Year celebrations was believed to involve abuse including implanted magnets. Animal rights groups called for the stunt, in which six fish were seen swimming in perfect synchronisation under magician Fu Yandong’s direction, to be banned.